We manufacture mouthpiece adapters, mouthpieces, and leadpipes for the professional trumpet player wanting to gain a performance edge. We invite you to browse our product pages and welcome your comments. TrueVee® began with our mouthpiece adapters as a solution to being unable to use your favorite mouthpiece in a different configuration. We now make four different standard adapters in your choice of brass or surgical stainless steel. We won't take sides in the positions that a cornet receiver should only receive a cornet mountpiece and a trumpet mouthpiece in a flugelhorn is just plain wrong. But, if your favorite mouthpiece isn't available in a different configuration or you just want to experiment with different timbres, you've come to the right place. Remember, if Geoff Emmerick didn't experiment in the recording studio, we wouldn't have Sgt. Pepper's Lonely Hearts Club Band. There's something very cool about using a flugelhorn mouthpiece on a trumpet. It's very dark and mellow. 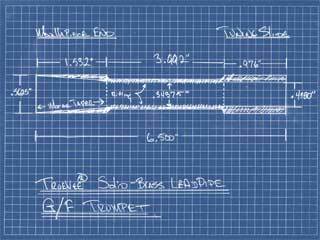 Our trumpet leadpipes are hand-machined from one solid piece of American-made yellow brass. They are not just soldered tubing with a trumpet receiver soldered in place. The mouthpiece receiving end of the leadpipe is reamed to a precise Morse taper using custom helical fluted reamers exclusively designed for us. 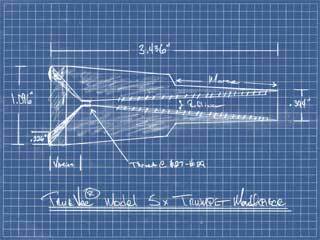 The tuning slide end is micro-bored by hand with a boring tool created especially for this purpose. It is then hand-lapped with Crocus cloth to ensure a perfect tuning slide fit. The inner bore of the slide itself has a gentle taper. The solid mass produces pure tone. The only solder used in this product is to attach the pinky ring! 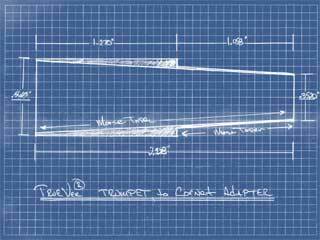 TrueVee® trumpet and cornet mouthpieces are hand-machined from American-made yellow brass. All our models, with the exception of reproductions of no longer manufactured mouthpieces, have a V cup. This is a true V cup, not a modified C cup; hence our name. The feel is similar to the Bach 5V series but that's where the similarity ends. The head contains a large amount of brass for a solid feel and pure tone. Each mouthpiece is individually made after it is ordered with custom cutting tools and reamers. They are constantly measured throughout the machining process to ensure accuracy. © Copyright 2019 by TrueVee® & TrueVee.com - All Rights Reserved.